Using the fall of Singapore to appeal to patriotism, the public is extorted to buy war bonds. A small amount of alcohol was given to those who purchased. During World War II, the government of Japan issued War Bonds using the Japanese Finance Ministry (Okurasho), the Nippon Kangyo Ginko (Japan Bank for Encouragement of Industry) and the Chokin Kyoku (Postal Savings Bureau). The proceeds from these bonds were used to fund the war effort. 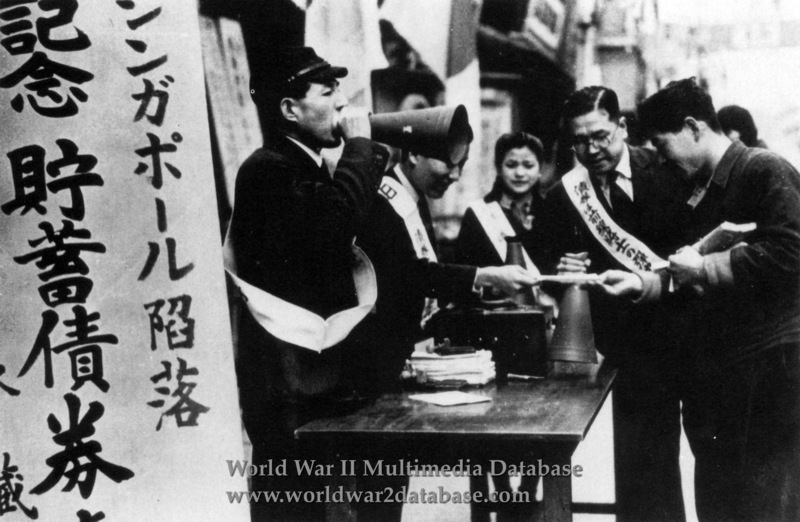 Unlike American war bonds, which were long-term investments, some Japanese war bonds were lotteries, where winners would collect a portion of the profits, with the majority going to fund the war.